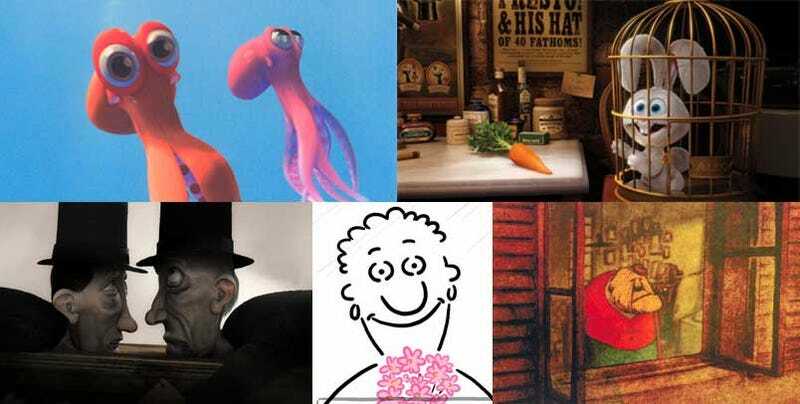 With the Oscars this weekend and all of their red carpet pageantry, it's always easy to forget that some of the most innovative art and storytelling is found in the animated shorts. With all the fun of copyright, we can't post the shorts for you, but hopefully there's clips will give you a slightly better background on the shorts than the 3-second blurbs on Oscar night. In a world gradually flooding with water, an old man adapts to changing circumstances and looks back on his life. A lonely lavatory attendant finds a bouquet of flowers in her tip jar. An octopus fights to keep his beloved out of the cooking pot. A carrot triggers a war of wits between a magician and his hungry bunny. A series of misfortunes befalls a pair of undertakers on their way to the cemetery. If you'd like to see thee shorts in full, at least a few will be making their way to iTunes, but also, Magnolia Pictures is running the films in theaters as part of a collection of Oscar-nominated shorts. You can see the city by city schedule here.